I have put this in this section even though it is not intended to be a new product but it's simply something I created for my own use. However, if there is demand it could become available. I do have a few spare boards. I needed a power supply that would power many different things for my bench test setup. And I did have a spare PC power supply so I thought it would be nice to use it and practical to have a 12V source but also have a regulated 5V and 3.3V source. The supply I have is a 650W unit and can supply up to 38A at 12V, 32A at 5V and 24A at 3.3V. The 2 connectors at the top right are to connect to the power supply: the one on the right is the 24-pin ATX connector and the one on the left is the 12V 8-pin connector. I have connected together all the 12V pins from those and divided the 12V supply into 5 independent circuits. The 5V supply has been divided into 2 circuits and there is one 3.3V circuit. Each circuit has its own power switch and there is a main switch that enables the standard ATX pin to turn on the power supply. Each circuit has its own fuse (standard ATO fuse to have the largest amperage selection), 3 screw terminals and 5-pin header. 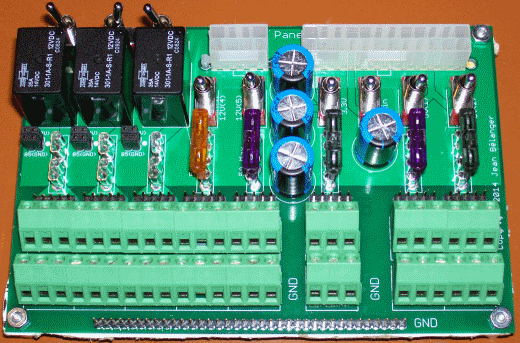 There is a corresponding 3 screw terminal per circuit and a 36-pin header for ground; ground is common for all circuits. The switches can handle up to 5A each so I have added a relay (ISO 280 footprint) for the first three 12V circuits. These can handle up to 35A each. The switch is connected to 12V and contact 86 on the relay and contact 85 is connected to ground. Contact 30 is connected to 12V and contact 87 is connected to the fuse. Also, I have put pin headers that connect between the switch and contact 86 and between contact 85 and ground. With shunts installed (as per the first picture), the relay is controlled by the switch directly. But it is possible to control either the + or - side from an external source by connecting a wire jumper instead of the shunt; for example I can connect a relay to the fuel pump output on a Megasquirt to power some injectors. Finally, I have added large capacitors (1000uF) to filter noise; there are 2 on the 12V supply, and one each on the 5V and 3.3V supplies. There are 4 mounting holes and I have installed 4 standoffs. Also, the standoffs hold a piece of cardboard so that the bottom is isolated; with all the exposed solder joints, it would be easy to have a short and some nice firework. That is going to make powering my different test setups much simpler. And it also has the advantage of using a single supply for everything so there won't be issues with ground offset which always happens when using multiple supplies (as I needed to do before). And with screw terminals and pin headers, I can quickly and easily power up different types of circuits, boards and proto-boards. I'd be interested in picking up one of the spare boards, depending on pricing and availability. This looks like it would be a good addition to the workbench, and a cleaner implementation of ATX breakout than a few that I've seen. And I couldn't find any breakout board that would do what I wanted. The ones I saw were very basic and did not allow using the high current capability of the supply which seems a waste. So I made my own; I'll see if I missed anything that I should have included (one thing I thought of later was that I could have added LEDs with the switches). The one you sent arrived today, faster than I expected considering how CanadaPost and USPS seem to like to shuffle parcels about between them. Now I just need to figure out where all I managed to put the parts that I have on hand, and order a few more little bits and pieces. Wow! That was fast. I still need to send you that BOM. I'll try to do that tomorrow. Did you have any part numbers for the angled 3-screw terminals? I have a good supply of horizontal 3-screw terminals, once I salvage them from some obsolete PCB's that I got from work, but the second row could be a pain to reach if the opening is facing the back of the first row! Also, what are the switches? Is there anything particularly special about them, other than being SPDT 5A? I thought I had done it but I obviously haven't posted the BOM. This one has the part numbers from Digikey and/or Mouser. It doesn't have both for every component but some equivalent and the parts mentioned are known to fit on the board. I did get a BoM from you, but it didn't have all the items or the majority of the Digikey numbers. I spent a little time cross referencing those but wasn't sure on the terminal blocks or switches. The issue is that not all the exact same components are available at both Digikey and Mouser. The parts in the BOM are known to fit the board but I'm not sure you can get all the needed components from one place. There are many similar switches but you have to be careful to choose one that has pins and not one that has posts because they won't fit in the holes. I think there are also switches that will fit which only have 2 pins; those will also work since you only need an SPST. As long as they have the same pin pitch and approximately the same overall size, you'll be fine. Check the datasheet from the part I listed in the BOM for the correct dimensions. The terminal block I listed from Digikey is a lot cheaper than the one from Mouser (the one in the picture). It is a bit less sturdy (and black instead of green) but would do fine. I caught that some of the items weren't available from Digikey that you had part numbers for from Mouser. One that made me scratch my head was the 8-pin Molex socket, which I would have thought would be relatively mundane compared to some of the stranger connectors! I did have the hardest time finding an interchange part for the relays, and then found that there was a Canadian made one, Z2648-ND, but they are a little more expensive than the Mouser offered Chinese(?) one that you pointed toward. After looking at the terminal blocks that I have in my scrap parts pile, I may actually get away with using two runs of them, as they are narrower than the area marked out in the silkscreen, and may allow enough space front and rear to connect wiring even when partially obstructed. That, or I may just reverse the blocks on the second row and have them face the pin headers. Actually, there are so many different Molex connectors that seem to be compatible with those ones that I chose one I saw referred somewhere else. I know that one fits on the board and has the correct mating interface but it has only one peg. So I did not put all the possible numbers because I wasn't sure which ones would actually fit but there seems to be a dozen different ones (in 8 and 24 position sizes) that could go there with and without pegs and in vertical and right angle versions. 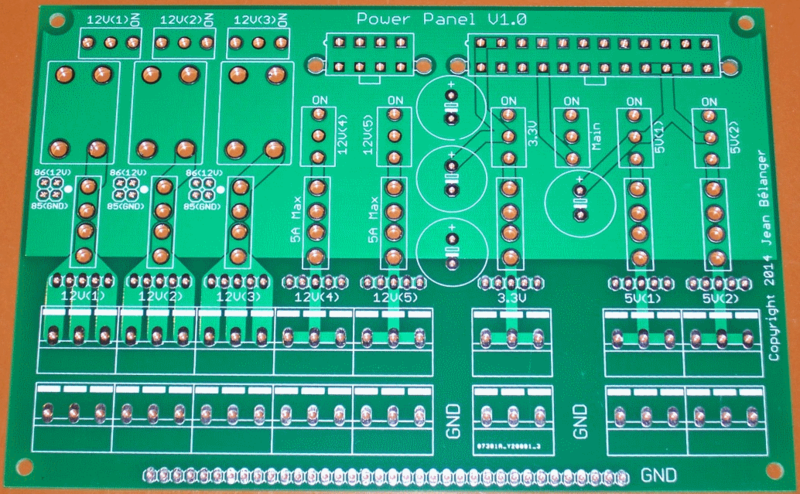 I think that the way I have positioned the connector, you could use a right angle connector that would connect from the back of the board instead of from above. And the angle terminal blocks do take more board space than the straight ones, at least those I've used. So you will have more space and using them back to back is likely not going to be too bad if you don't think you need to use the pin headers. I'd be interested in knowing more about the relays. The ones I list in the BOM were the only ones I found that were readily available in that high of a current rating. If there are other choices (even if the rating is a bit lower), it would be good to know. Are these still available? Please send me a pm if they are. Yes I still have a few boards. But I don't have the components to populate it. 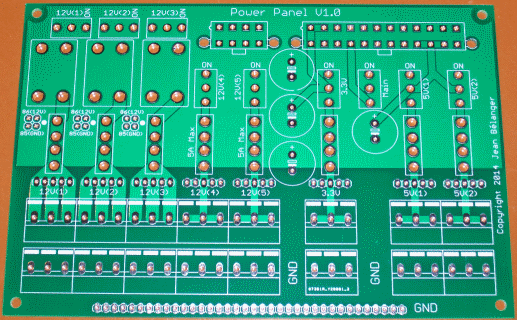 Do you have a spare PCB available ?